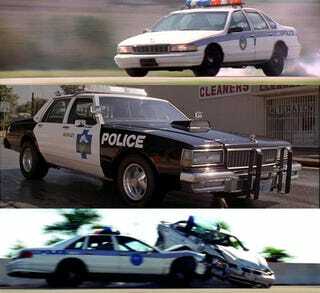 In honor of the return of the Chevy Caprice police car, and because it's one of the most ubiquitous film cop cars of the 1980s and 1990s, we've put together the ten best criminal-chasing, car-smashing Caprice police movie cars below. Role: Oh man, Martin Lawrence movies. This is a classic 9C1 done up in a fake highway patrol livery. Given the movie is supposed to be contemporaneous in 1996 it's a little questionable that this vehicle would still be in service in this great condition, though we've seen local sheriffs drive in older cars. Role: Carrying police officers and K9 unit to the scene of the crime. We love wagons, and the SSV wagons were popular with police forces for non-patrol units such as K9 (seen here), special investigations, and special traffic duty. Role: Chasing those 2 bad 2 be stopped guys, the 9C1 typically manages to keep up with even the most hopped-up rides in films. Because this is a 1995, we assume it has LT1 V8 power and thus is able to blow the doors off your average Honda Civic. Role: Attempting to kill Neo. There were so many GM vehicles in this movie you knew you weren't going to see a Crown Vic. There's also something decidedly more sinister about the 9C1. Role: Getting smashed up as the bad guys, not to be confused with the bad boys, who are tossing cars off a transporter! May God help you if you're a police officer in a Michael Bay film because he has a penchant for crushing Caprices. Role: Why do we love Mike Judge? The intricacy of the animation and the attention to detail. When Hank Hill moved up from a Ranger to an F-Series Super Duty we all noticed. And we noticed when the cops in the standoff had Caprices. Role: "Bees! Bees! Bees in the car! Bees everywhere! God, they're huge! They're ripping my flesh off! Run away, your firearms are useless against them!" Role: One of the few films we feature using a Caprice during the early 1990s, the lighting package is ideal for a county police department in middle-of-nowhere Texas. Oh man, you don't want to know how this ends. Role: "Well, I got a 426 hemi here, 3/4 cams, nitro boosters, I can get 'er up to as good as 155! Never do, though, of course, unless I'm chasing a cute chick in a Ferrari! HAHAHAHAHAHAHAHAHAHA! I guess I was goin' about... 65, tops." Of course, it's unlikely there is HEMI under there given it's a GM product, but who knows. Chris Farley is crazy.